MATCO mfg produces a superior 6" inch wheel and brake assembly for use with aircraft requiring less than 700 lbs per wheel. This model uses 1.25 inch TAPER/ROLL bearings. (Check the product comparison table for other bearing and caliper configurations). The MHE6B E SERIES is a 6" inch wheel with 6.22 inch width with an additional 1.31 inch caliper spacing. Bearing spacing is 2.71 inches and axle spacing is 0.68 inches. The total weight of this wheel and brake assembly is 6.3 pounds. 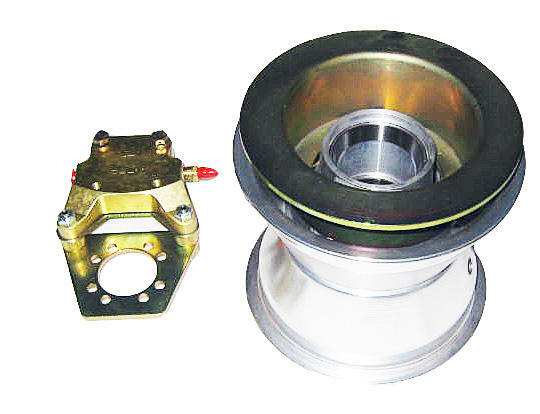 The bearing axle diameter is 1.25 inches. Precision machining on the MHE6B wheel allows for the use of a variety of tires to include Goodyear, McCreary, Michelin, and many 6" industrial tires. Tires wider than 6 inches require the addition of MH E Series spacer kit to match the axle.